Mezes on The Danforth at Logan transforms meals into experiences. A meal at Mezes is a genuinely Greek experience, full of conversation, laughter and a variety of dishes. From saganaki to moussaka to baklava, dinner at Mezes is a culinary journey to Greece. Love the food. Ordered hot peppers with feta was spicy and delicious, the chicken dinner joins the comfort foods list. Warm service. Homely ambience. Worth eating. I have been going to Mezes on and off for about 20 years. They used to be the BEST on the Danforth, Not sure about that anymore. My wife and I went there a few Fridays ago. The place was packed but we were seated in about 10 minutes which wasn't bad. I ordered the pork souklaki dinner and my wife ordered the chicken souvlaki dinner. The chicken was tasty but found the portions to be on the smaller side considering paying close to $20 per dinner. My pork dinner came a bit over cooked and pretty dry. It used to be so much better but as with most restaurants, once they get a bit too popular, their prices go up and the quality goes down. I may give Mezes another shot as this was only the 2nd time I was disappointed. Another thing that keeps me away from there is that they pack you in like sardines and the place is very loud. I like to be comfortable when I go out and not hit the guy behind/beside me when grabbing my coat. The service was kind of slow too but they were really busy. I actually phoned it to tell the manager how much we enjoyed our meal and the service the last time we went. He was so gracious and appreciative of the call. My family has been there a fewr times now and they never disappoint. Great lamb chops! I've been to Mezes several times now and I've always had an excellent meal. I'm not a big fan of greek food in general because I'm vegetarian and have limited options (it's also starchy with the rice and potatoes -- though delicious), but I've always left Mezes stuffed and satisfied. I was there last night again and ordered the vegetarian platter, and my dinner partner ordered the vegetarian moussaka. We shared a plate of dips as an appetizer. The dips were fantastic -- their tzaziki is absolutely the best. 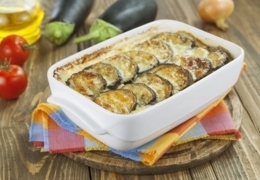 The only one lacking in flavour was the eggplant dip, but the others made up for it. The pita arrived with it hot and garlicky. Our meals came soon after we finished our appetizers and were steaming hot -- I'm not sure why someone here claimed it was like it had been microwaved. My food was fresh and grilled PERFECTLY. When I bit into the potato it was so hot and steamy, fresh from the oven. The salad is lightly dressed with their own vinegar. I am really picky about the quality of my food, and I can honestly say I think Mezes is one of the best on the danforth. Been here 2 or three times in the past year. Was a great experience. Yes, they are pretty busy, but I would not say that the food took longer to arrive than any other busy restaurant. They take reservations now, so to avoid standing in line, just reserve. Servers are very warm, and put soul and personality in their work, not like manekens in oh so many restaurants. Emotions is good. But perhaps, you need to come from similar culture to appreciate the serve scopping left overs of the dip and putting it on our plate before taking appetitizer platter away. I had scallops in cheese - was ok, but too fatty. The meat and pita dips are amazing. They really go distance for such a good lamb. And the portions are large, so you definitelly will not go undereaten like from some fine dining place. And the prices are reasonable for the quality of food. Have visited many times, and each time is better than the last. 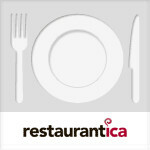 Service is gracious and warm, the food is unbelievably good and reasonably priced. Order many dishes to share, but be prepared not to want to! I humbly submit that this is the very best Greek restaurant. Overall the food wasn't bad I wasnt too impressed with the stuffed baked potato. maybe it would of tasted better as a side dish and not as an appetizer. I think it should be removed from the "Appetizer Menu" Other then that the other food was good. We also waited 45+ min for a table. Amazing beef souvlaki. They use high quality, tenderloin - add that with their excellent roasted potatoes & salad and you couldn't be happier. I'll definitely be coming back. After hearing decent comments about this small restaurant, I decided to finally dine at it with my wife. After the poor service and extreamly long wait for our appetizers, I just wanted to get up and leave. Finally when our food arrived, the quality of the meats and vegetables was poor, and not only that but it was farely cold like it had been microwaved, or sitting under a heating lamp for an excessive period of time. To get another beverage was nearly impossible; I did not enjoy the visit what so ever, and being as it wasn't that busy at the time theres no excuse for the lack of service and quality. I highly DO NOT reccomend this restaurant to anyone. Mezes is known throughout Greek Town for not the delicious food, but for the experience provided for diners. 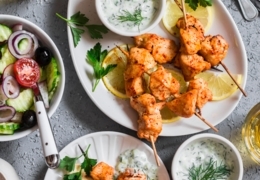 Offering authentic Greek service, chicken souvlaki dinner is served with Elliniki salad, rice, roasted potatoes and homemade tzatziki. 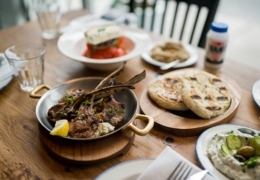 This authentic Greek restaurant brings the culture’s essence to Toronto. With an emphasis on sharing and sampling every plate, Mezes serves meals that bring diners together. Try the table-pleasing saganaki – pan-browned and Brandy-flambéed cheese that’s prepared at your table. Entrees stay true to the Greek flavour, with full fish, souvlaki and moussaka —all perfect for sharing. Even with an abundance of restaurants along the strip, this one still stands out.